The Samba server allows you to share the content on your USB storage device(s) with other devices that are connected to your local network (mostly computers). These devices have read and write access to the shared content. 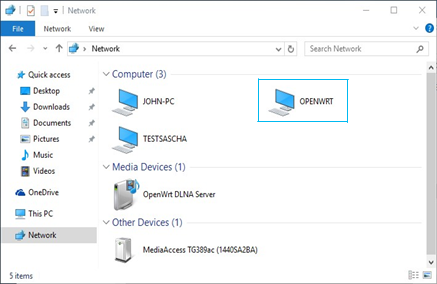 Open (File) Explorer and then choose Network. The Network window appears. Double-click OPENWRT. 192.168.1.1 in the address bar. The storage devices that are attached to your Technicolor TG589 router are listed as folders. If you plan to frequently use this folder, it might be useful to map this folder as a network drive. For more information, see the help of your operating system. Open a Finder window. Under SHARED click openwrt and then click usbdisk.